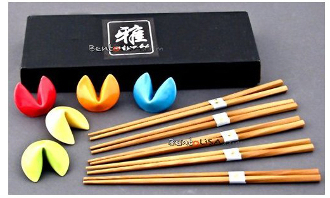 This 5 piece Fortune Cookie Chopstick Set. The Fortune Cookies come in a rainbow of colors and made from ceramic. Copyright © 2001-2019 Nikkei Traditions of San Jose Japantown, Inc. All rights reserved.